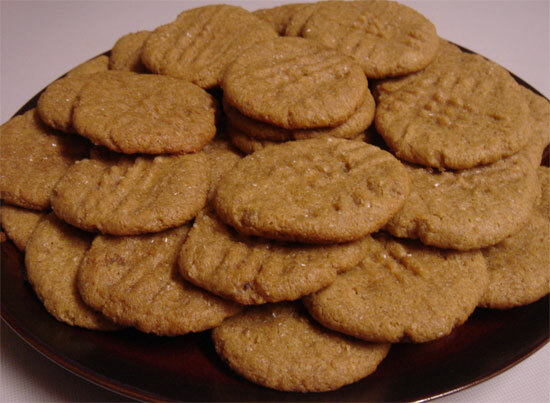 Who can resist homemade peanut butter cookies: the aroma, the sweetness, the saltiness and the crumbliness. There is nothing not to love about peanut butter cookies except for the fact that they aren’t part of a complete breakfast. However, these cookies are a little different in that they contain no flour and are gluten-free. In fact, they only contain 3 basic ingredients. The amount of sugar in these cookies is relatively low – if you ate 2 of them, you’d only be consuming 1 tablespoon of sugar (or 3 packets). So I’m going to claim here and now that I, The Peanut Butter Boy, declare that 1 or 2 of these peanut butter cookies are part of a complete breakfast. That goes for lunch and dinner too. They’re also a great (and portable) way to get some fat in your diet throughout the day. I’ve made these twice now, and they don’t last more than a few minutes with guests (or girlfriends). I originally found these on Gluten-Free Girl and only changed them a bit. 1. Preheat oven to 350 degrees. Mix the peanut butter, brown sugar, white sugar and baking powder in a large bowl until well combined. Add the egg and mix. If using chocolate chunks, stir them in now (untested). 2. Roll mixture into about 1 inch balls and place on an ungreased cookie sheet (If you are placing chocolate kisses on top, you may want to use 1.5 inch balls). Pour some raw sugar onto a small plate. Take a fork and touch the batter with the back of the fork, then press the fork into the raw sugar. Now, press the fork down into one cookie and press into the sugar again. Press down into the cookie in the other direction, creating a cross-hatch. Repeat for all cookies. 3. Bake for 10 minutes. Too little time and they won’t hold there shape well. You may be able to bake them as long as 12 minutes, but be careful of burning the bottoms. 4. Remove from oven and let sit in pan for 5 minutes, then remove and place on a cooling rack for 10 minutes. Press chocolate kisses into each cookie when you take them out of the oven, if using. Makes 48 cookies. I just thought of something. You might want to try using a whole jar of my Cinnamon Currant Peanut Butter instead, or for that matter, my Dark Chocolate Peanut Butter. Actually, I’m going to try that right now. I used to make something like these when I was in my teens, but this takes them to a whole new level! My recipe was one cup peanut butter, one egg, and one cup of sugar. You had to let them cool a bit as they tended to break up when still hot. You sound like a former roommate who swore by pumpkin pie for breakfast, to get those anti-oxidents in. I’m totally into any recipe that I can eat for breakfast or dessert! These are without a doubt the best cookies I’ve ever eaten! I have to give them away because I’ll them all. I’ve even lied to my children so I can have the last of the batch! I made these tyda and they are indeed wonderful — better than the last recipe I tried! I let them bak for only 10 mins, but I suspect they need a bit longer in my oven as they were “crumby” — but messy food is always good food! Love you site, by the way! Can’t wait to try more of your goodies! Made them tonight, sooo good!